Halloween has always been one of my favorite celebrations. I especially love carving pumpkins, where my less than artistic talents can still shine. My young nieces liked the faces on the big round pumpkins that we created together (mostly). After scooping out slimy pumpkin guts and seeds, my 6-old niece vanished for awhile. The younger one arrived after her smiley face was done. They didn't seem to notice that the jester looked more like a rabbit, or that the eyeballs were different sizes. My sister's pumpkin was more symmetrical -- she has a better eye for that -- and her kids loved them all. Once we lit the candles and turned out the lights, the jack-o'-lanterns came alive. As a fan of chocolate, Halloween always challenged my self-discipline. I remember as a kid spreading out the night's haul on a card table and trading big (and they were big back then) candy bars with my brother. We were always a bit tentative visiting the neighbor that handed out raisins and other healthy foods. Not that we were afraid of these "treats," we were just on the hunt for candy, and lots of it. In our New Hampshire community Halloween is celebrated on October 30th. I can't explain why -- something about looking for a treat this night, and if a house fails you, then you return the next night (Oct 31st) to play a trick on them. We go with the flow, so I lit my rabbit-like jester jack-o-lantern and waited for a small gaggle of neighbors to stop by. We served up Lindt chocolates, local Macoun apples, and homemade oatmeal raisin cookies. Kids and parents alike endulged in all three. One youngster commented, "this apple is great." Good to know that kids like healthy food and neighbors trust neighbors with homemade food. Halloween also ushers in a transition from early fall when trees are cloaked in brilliant colors to late fall when winds blow hard and leaves fall quickly. Our eyes shift from looking up at trees in fall colors to our feet as we shuffle through layers of crisp, fallen leaves, still colorful in their bronzes, coppers, maroons, and deep yellows. Coppery beech leaves on Halloween day. The garlic is planted, plans for a Thanksgiving family gathering are underway, raking leaves is the chore of choice, and the winds are shifting. Snow is not far behind. I wrote about witch hazel in August, when the leaves were still bright green and the shrub was not yet in bloom. Walk the woodlands today and you will see the pale yellow flower petals sticking out like wild hair along the slender branches. This quirky understory woodland shrub blooms in late fall just as its seed pods from the previous year pop open, shooting their seeds 20 or 30 feet away. The beautiful scalloped leaves have turned yellow, creating a soft glow beneath a canopy of hardwood trees. The leaves, borne on arching, layered branches, are slightly askew at the base, and with their wavy edges, are unlike any other woodland shrub. Witch hazel leaves are starting to fall, even as the flowers remain into November. Even when fallen their leaves add color and form to the forest floor, among the granite rock, decaying wood, and curled, brown leaves of trees. On October 17th I posted a piece on black racers, as I thought I had spotted this species in two different places. My identification was wrong and I have updated the post. You'll have to visit the post on Racers-Updated to find out the real identity of those two snakes. Acorns, the hard-shelled fruits of oak trees, are falling to the forest floor. Red oak, the most common oak in our region, is having a banner year. Their nuts are so thick on some sidewalks and woodland trails, it feels like walking on a bed of marbles. If only these were a great snack for humans, then I would not have to carry lunch in the field. Alas, the red oak acorns are full of tannins, which are not good for our digestion. One can make acorn flour, after a lengthy process of grinding and then rinsing in many changes of water. Squirrels, mice, blue jays, rose-breasted grosbeaks, wood ducks, deer, wild turkeys, and other animals are a bit more fortunate. They can eat these nuts, although they do prefer white oak acorns, which have much less tannin. Oaks fall into the "red oak" group and the "white oak" group. Leaves of the red oak group have pointed lobes, their acorns are bitter and mature in two years. White oak leaves have rounded lobes, their acorns mature in one year and are sweeter. Acorns have a cap at the stem end. The caps of reds and whites are also different. The red oak has a flat saucer-shaped cap, looks like they are wearing a tam o'shanter. The white oaks, in contrast, sport a deeper tea-cup shaped cap that covers more of the nut. The cap, more scientifically called a cupule or involucre, are the woody bracts that form around the ovary of the female oak flowers. A more fanciful name for these dime-sized caps is wee folk hat. Oaks produce banner acorn crops only every 2-5 years for red oaks and 4-10 years for white oaks. Some years the trees produce only a few acorns. In average years a single tree may produce 10,000 acorns. A banner year may produce 100,000 acorns per tree. The amazing thing about these boom and bust acorn cycles is that it is a group phenomenon. Oaks synchronize the timing and quantity of acorn production. For example, all the red oaks in an area will have similar acorn crops in a given year. Acorns are favorite foods of birds, mammals, and insects. Out of 10,000 acorns that fall from a single tree, likely only one will survive to germinate. More than 90% of the acorns that fall are eaten or damaged by predators. This banner acorn crop will be a boon for all the animals that eat the nuts. Next year look for more mice and squirrels, which leads to a boost in hawk and owl populations. Deer populations will increase after fattening up on acorns in the fall. More mice and deer also means more ticks and Lyme disease. The white-footed mouse is a primary carrier of the Lyme disease spirochete (bacteria). Ticks become infected by feeding on mice (and other small mammals such as chipmunks). The ticks then hop onto deer (which are not a carrier of Lyme), which then move the infected ticks from place to place. Another reason not to feed or otherwise attract deer to your yard. Oaks do not start to produce acorns until about age 20, and then only really good crops at age 50 and thereafter. Big oaks, with diameters of two-feet or more, produce healthy acorn crops. Clearing competing trees from under the canopy of maturing oaks is one way to enhance acorn production. This allows the oak to produce a broad canopy and lots of acorns. Look for fallen acorns as you walk the woods this fall. Many acorns are now hidden beneath a bed of fallen leaves. Search for white and red oaks and notice the different leaves and acorns. The red maple is so well-named. to its scarlet red leaves in fall, this tree is cloaked in red. The red maple is a bit overshadowed by its close cousin, the sugar maple. The sugar maple's sweet sap is tapped each spring to make maple syrup. Its wood is sought for floors, cabinets, and furniture. People flock to New England in the fall to see hillsides of sugar maples decked in brilliant orange-yellow leaf color. And Canada has a red sugar maple leaf on its flag! If you look about though, you will see that red maple is really the dominant one. Red maple is one of the most common and widespread trees in the East. It grows in shade or sun and occurs in many, many different habitats. Perhaps it is best known as a "swamp maple" for its fondness for wetlands, edges of sluggish streams, and other wet spots. Red maple also grows on dry ridges, ridge tops, rocky or sandy slopes, and just about anywhere. 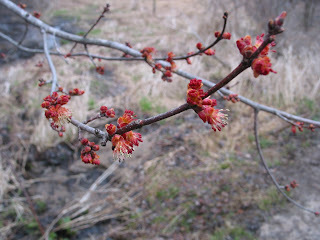 Red maple is one of the first trees to flower in the spring and one of the first to start turning in the fall. By late summer the swamp reds have turned the wetlands scarlet. The early turners drop their leaves early. Other red maples are still changing in mid-October, brilliant in their reds, greens, and yellows, like the flags of Bolivia or Mali. The multicolored patterns, like snowflakes, unique to each leaf. amid a greenery of pine, oak, and hemlock. Red maple is considered an inferior lumber tree by some, prompting the name "soft maple" (sugar maple is considered a "hard maple"). Some day red maple will be popular. Its good looks in the fall and scarlet blossoms in spring are good enough for me. And its "softness" makes for good nesting cavities for nuthatches, chickadees, and woodpeckers. After a day of cold rain. I wrote this piece on black racers last week, after I thought I had spotted two black racers in New Hampshire. I submitted photos of one to the NH Fish and Game Department (NHFG) Reptile and Amphibian Reporting Program (RAARP) and apparently I was tricked by a northern water snake. Turns out both were this much more common species. If you click on the second photo to enlarge, you will see the features that Mike Marchand of NHFG noted to identify this as a northern water snake: keeled scales, vertical lines on lower jaw, horizontal crease on upper jaw, banding on upper part of body. A black racer lacks keels and is universally black. What befuddled me was that the two snakes I saw were relatively slender, not the big robust older water snakes. It is supposedly the older water snakes that take on the darker, more black color, the younger ones show more of the mottled pattern of typical water snakes. The lesson learned is never identify a species based on color - I should know that by now. What follows is my original piece on racers - I hope to really see one some day! Eleven different types of snakes live in the wilds of New Hampshire. The most common is the garter snake, often seen in yards and gardens; the most rare is the timber rattlesnake known to occur in only one location in the state. Many of the snakes are named for their colors or patterns -- smooth green, brown, red-bellied, ringneck, hognose (with its upturned nose), ribbon. A few are named for their preferred habitat -- water snake, timber rattlesnake. One is named for its color and its speed - the black racer. This elegant snake is glossy black, long and slim, with a not so noticeable white throat and chin. Racers are known to be fast, and when harassed or captured are aggressive. I would thrash about too if disturbed in such ways. In the past month I have come across two black racers, a rather uncommon sighting as they are listed as state threatened. I saw these two racers in different locations. Each was calm, resting along side the trail. Neither budged or flicked its tongue or gave any indication that it was concerned about people or dogs walking by within inches. Bella, the springer, passed by or over without noticing the snakes. Despite its species name, constrictor, the black racer does not kill by constricting. Instead it bites and holds its small prey--frogs and toads, eggs, insects, small birds, mice and voles, and other snakes. Like 5 other New Hampshire snakes, black racers lay eggs in loose soil or in hollow logs. The young hatch in late summer. The other 6 snakes give birth to live young. Racers live in old, overgrown pastures, woodland edges, roadsides, or other young growth. Mostly they are found in dry, shrubby areas, but do occur in wetter sites. They spend the winter hibernating in rock crevices or abandoned woodchuck holes. Perhaps the [snakes] I saw in September were too cold to move away as we walked by, getting ready to slip into their den for the winter. Given the cold temperatures this week, below freezing several nights in a row, I am feeling the same way. It is taking me longer to warm up in the morning darkness, the sun not yet up as we walk the dogs. The summer clothes have long since been shed for winter wear. Hats, gloves, heavy fleece, and the thermostat turned up is our version of hibernation. As I rub my cold hands together I imagine a tangle of snakes huddled together in a woodchuck borrow. I think they are warmer. We drove over 2,500 miles in two weeks from Seattle to San Francisco, taking in four national parks, several state parks, national forests, and scenic drives, as well as more urban areas. This was a whirlwind tour given the vast distances we traveled. We will return some day to spend more time at each place. We needed more time to walk about downtown Portland, to explore the beaches on the Olympic Peninsula and the lava fields of the Oregon high desert. The trails at Crater Lake, Smith Rock State Park, and Yosemite were left for another time. The Columbia River Gorge is full of trails, waterfalls, overlooks, fish ladders, wind surfers, and so much more to see and do. Our journey took us from tide pools full of anemones and starfish in Olympic to the warmer waters of Monterey Bay, home to playful sea otters and hungry brown pelicans. In Seattle we wandered through the Pike Place Fish Market crowded with other tourists and vendors selling fresh seafood, vegetables, fruits, flowers, crafts, snacks, and peppers of all shapes, colors, and flavors. We hiked among cool glaciers, tall evergreens and colorful alpine meadows; among volcanoes, calderas, cones, lava fields and other rock formations; and among massive, old Sitka spruce, giant sequoias and western red cedars and trees laden with clubmoss and ferns. We soaked up the solitude of Beach 4 on the Olympic Peninsula and enjoyed the bustling energy of Curry Village in Yosemite Valley. Atop The Watchman, at over 8,000 feet, we looked down into the deep blue waters of Crater Lake. Dams large and small are visible across the west, the need for power, drinking water, and irrigation continues apace. Seeing a Chinook salmon make its way up a fish ladder at the Bonneville Dam on the Columbia River is another reminder of the pressures we place on nature. San Francisco's Chinatown offered a sobering look into one small shop full of shark fins, bird nests, and ginseng. One wonders how the wilds can sustain our needs and desires. The Japanese Garden in Portland lingers in my mind. Our brief visit made special by our good friend Rosemary, who spent 3 years volunteering there as an interpretive guide. The beautiful architecture of the tea room drew us inside. Rosemary spoke of the four, centuries old principles still central to the ceremony -- harmony, respect, purity, and tranquility. Purity referring to "making the tea correctly" and cleansing ones hands and mouth with water from a small stone basin. is also a transformative experience. One of the last stops on this two-week adventure was a visit to the Monterey Bay Aquarium. The exhibits include live animals, touch pools, outdoor viewing platforms, huge tanks with inner bay and outer bay sea life, the splash zone for kids, sea otters, penguins, and the Seafood Watch with tips on the best ocean-friendly seafood. An exhibit on the secret lives of seashores left us stunned and awed by the beauty and grace of these sea creatures. The leafy sea dragon is one of the most elegant marine fish (can it really be a fish). Two tiny fins propel it slowly through the water so gently that it looks to be floating. The leafy protuberances, resembling seaweed, serve only as camouflage. that we saw and met on our journey. We arrived in Yosemite National Park a week ago today for a one night stay, driving nearly four hours from the San Francisco Bay Area. In the late 1860s, John Muir set off on foot on the same journey, discovering what he described as the "the grandest of all the special temples of Nature." As part of a two-week west coast trip that included visits to Olympic, Mt. Rainier, and Crater Lake National Parks, Yosemite was our final Park. After experiencing the beauty, diversity, landscapes, and history of three National Parks, we descended into Yosemite Valley with the same anticipation of entering another "temple of nature." And surely Yosemite is grand. Yosemite has drawn visitors--now more than 3.5 million each year--to its valley since before its official establishment as a National Park in 1890. Even in late September the Park is full of people, coming to a place steeped in history, drawn to its granite cliffs, stunning vistas, massive trees, waterfalls (the tallest in the world), and wildlife. in awe as climbers make the 4 to 8 day ascent. The first ascent in 1958 took 43 days. Accommodating millions of people a year takes its toll on Yosemite. To alleviate some traffic congestion and pollution, the Park operates hybrid electric diesel buses to shuttle people throughout the valley. The buses are convenient and comfortable and maybe someday will be or should be mandatory; people can still opt to drive everywhere. One of our bus drivers provided an informative interpretive tour as she drove from stop to stop, which she herself said was unusual as most other drivers are silent. Yosemite has lots of overnight options. Camp 4 is the rustic (and probably rowdy and ripe) camp for climbers and their helpers. Yosemite Lodge and the Ahwahnee provide lodging at the upper end of comfort. We opted for Curry Village, with its maze of canvas tents, cabins, and other rooms. With the spirit of an outdoor college dormitory setting, Curry Village is lively, busy, and surprisingly comfortable; perhaps too comfy. The canvas tents were outfitted with cots, sheets, warm wool blankets, towels, lights, bear locker for food, and a lock for the tent door. Down a dirt path a large clean bathroom and shower facility was as elegant as our home baths. An indoor meeting space offered free wireless internet access, tables for games or puzzles, soft chairs for reading. Another building in the complex housed a cafe, store, and the Pizza Deck -- we joined what seemed like everyone else in Curry Village for a darn good pizza. The wildlife are tame in Yosemite. This may be an unfortunate result of too much human food discarded intentionally or unintentionally. Most people seem to miss the wildlife, or perhaps they are so accessible that they appear like just any other visitors. We enjoyed the antics of the birds and especially the squirrels and chipmunks. Yosemite is host to three groves of giant sequoias (Sequoiadendron giganteum). Of the three, Mariposa Grove has the most big trees and is the most popular. So popular that the only brochures left in the kiosk were in French and German, the English versions had run out. As their name suggests, sequoias are huge, their size can barely be captured in photos. One of the biggest in the grove is the "Grizzly Giant," over 200 feet tall and 31 feet in diameter at its base, it is estimated to be 2,700 years old. Given its girth and height, giant sequoia evergreen leaves and cones are surprisingly small. The cone is the size and shape of a large chicken egg. Giant sequoias are adapted to fire, germinating from seed in mineral soil exposed to full sunlight and free of competing vegetation. Decades of fire suppression have helped shade tolerant firs and cedars out-compete the sequoias. The Park Service now sets fires purposefully to help the sequoias germinate. At Mariposa Grove a park naturalist was thrilled to point out a year-old prescribed fire that was visible along the trail. The firs and cedars killed, mineral soil exposed, and tiny sequoias emerging. Although the sequoias were also burned, their 2-foot thick bark protects them from serious injury. Other species depend on the dead trees that result from fire or help with seed dispersal. We caught sight of the beautiful white-headed woodpecker and the more common Douglas's squirrel chattered as we walked by. We were on our trip, and so caught only glimpses, just as the documentary on PBS by Ken Burns -- The National Parks: America's Best Idea debuted. Instead we were experiencing it live, and yes it is American's best idea.